When my boyfriend brought home Maribel Lieberman’s limited edition Spring Showers Box, featuring a reproduction of the "Umbrellas in the Spring" print by her husband and artist Jaques Lieberman, my eyes completely lit up. Mrs. Lieberman, chocolatier, designer and founder is clearly a proponent of the marriage between good design and fine chocolate which, as an illustrator by trade, and chocolate enthusiast by hobby, happens to be the perfect incarnation of my two loves. Made of premium dark, milk and white chocolate and up to 72% cocoa content, each lovely design corresponds to it’s own luscious indulgence. You get to customize your box when you buy them from her Broome Street boutique. My box contains such flavors as: capirhinia, cardamom, champagne and espresso. Unfortunately, they’re simply too pretty to eat! If you’re expecting a full report, you may have to wait until I bring myself to bite through all of that gorgeous design. Bravo! Chocolate and Design are the perfect marriage. 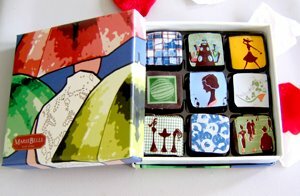 When are we going to see your wonderful illustrations gracing a box of chocolate? What fun! I looked over the Spring packaging when I was there a couple of weeks ago, but opted for the classic box with my selection. On the whole though, I think I preferred Vosges ... but I might need to do more tasting! Wow! Now I have officially seen it all. And I thought I was a nerd...but you take the cake (ummm CHOCOLATE cake, of course). Yes indeedy, I am hating on your creativity. Mad, because I didn't think of it first. But I must confess: I am not a big chocolate person. Why? Because it gives me a headache if I eat too much. Especially, those frenchy chocolates, too strong, taste like medicine….yuck! (NH). So, for being quicker than I...Here is some dosage of chocolaty hate. Bong!